Mayor Bill de Blasio signed 11 bills today intended to make it safer to walk, bike, and drive in New York City. De Blasio was joined by in Queens this morning by Transportation Commissioner Polly Trottenberg, NYPD Chief of Transportation Thomas Chan, City Council Speaker Melissa Mark-Viverito, council transportation chair Ydanis Rodriguez, and other council members. Bills signed into law include Intro 171-A — “Cooper’s Law” — which will allow the Taxi and Limousine Commission to act against hack licenses of cab drivers who injure and kill pedestrians while breaking traffic laws, and Intro 238-A, which makes it a misdemeanor for drivers to strike pedestrians or cyclists who have the right of way. Streetsblog will have full coverage of the presser later today. Will the Mayor’s Office of Criminal Justice be responsbile for ensuring that NYPD and TLC act on their new responsibilities under these laws? Do they just do guns? If not who will? 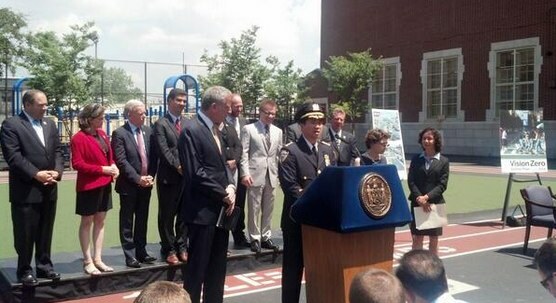 Is it the “Standing Vision Zero Task Force?” Does that have a chair, a staff director and staff? Where is the there, there? Just asking because the city has terrible track record of enforcing existing laws — are there any tractor trailers 55ft or less on NYC streets?